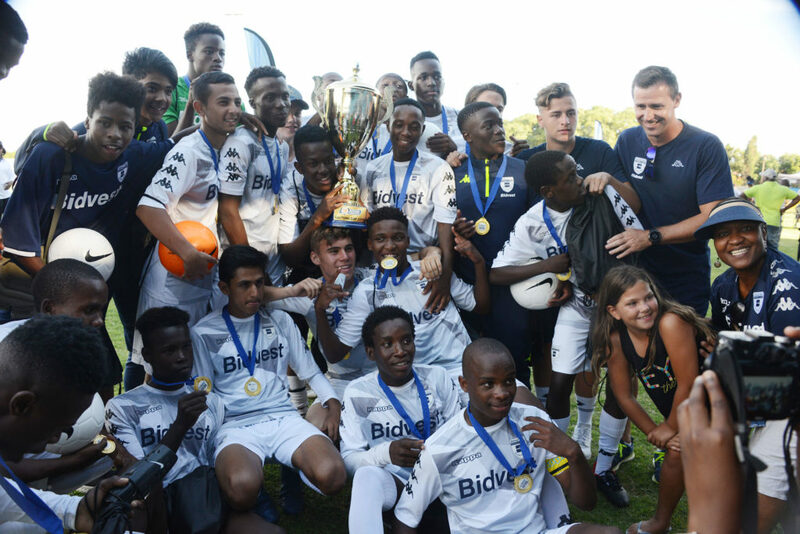 Johannesburg, Sunday, 17th March 2019 – Bidvest Wits have been crowned 2019 Future Champions Gauteng Cup winners for the second successive year after two days of enthralling action at the WJ Clemments Stadium in Reiger Park, Boksburg that saw the best clubs and schools in the Province clash with the SAFA districts for the coveted first prize. Wits edged Orlando Pirates FC 3-2 on penalties in the final after the teams had played to a 0-0 draw, another tightly-contested clash on a day when there was very little to choose between the teams. Both sides qualify for the prestigious Future Champions Gauteng International Tournament that will be played at the Nike Football Training Centre in Pimville, Soweto from 25th to 30th March, along with Kaizer Chiefs, who finished third in the Gauteng Cup. Chiefs edged Highlands Park 3-2 on penalties after their bronze-medal match had finished goalless. That had followed two tense semi-finals, when Pirates edged Chiefs 1-0 in a mini-Soweto Derby, thanks to a penalty from forward Boitumelo Radiopane. The other semi-final ended goalless between Wits and Highlands Park, with The Clever Boys holding their nerve to win the shoot-out 4-3. SAFA Johannesburg and Dr BW Vilakazi Secondary School booked their place in the final of the girls’ competition that will be played at the Future Champions Gauteng International Tournament. SAFA Johannesburg, who made the final last year, topped their pool at the Gauteng Cup with a win and a draw, Kekgethegile Mohasoa bagging a brace as they claimed a decisive 4-1 victory over SAFA Tshwane. SAFA West Rand did not feature on Sunday, meaning Group A was a straight shoot-out between SAFA Sedibeng and Dr BW Vilakazi Secondary, which the latter won 2-1. Zara Wilkinson, who was one of the talent search players selected to go to Spain at the end of last year, turned out for SAFA Johannesburg. Saturday saw the group action in the boys’ tournament as Wits edged SAFA Ekurhuleni in Group A on goal-difference after both sides ended on seven points. The teams had played to a 0-0 draw in what proved the shoot-out for top spot in the pool. Highlands Park knocked SuperSport United into second place in Group B, with the latter’s chances stymied when they were held to a 0-0 draw by Clapham High. Chiefs won a Group C that saw just three points separate the top team in the pool and bottom-placed Jomo Cosmos. Chiefs finished with a win and two draws for five points, with Reshogofaditswe Secondary and SAFA Tshwane joint second with three. Pirates romped through Group D though as the only side in the first round to win all three of their matches. The decisive match in that pool came when they edged Mamelodi Sundowns 3-2 to book top-spot. Mamelodi Sundowns forward Thando Buthelezi finished as top-scorer at the Gauteng Cup with five goals. 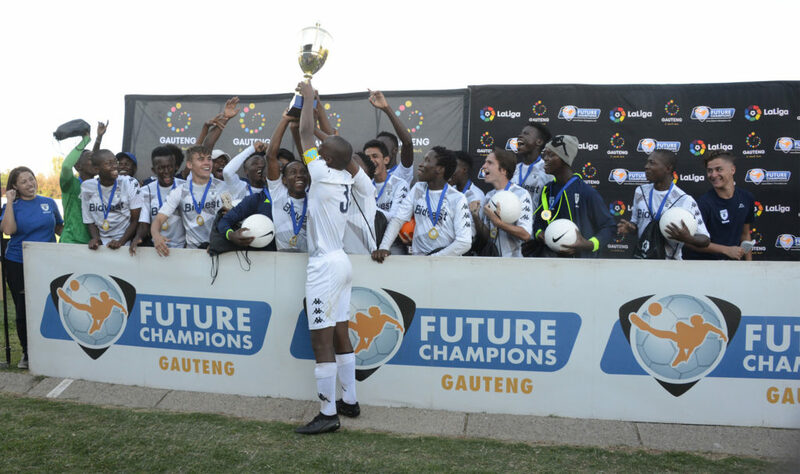 The Future Champions Gauteng Cup was organised by Global Sports International in conjunction with Gauteng’s Department of Sport, Arts, Culture and Recreation, and the Department of Education, as well as the South African Football Association. Other partners include the PSL, City of Ekurhuleni, LaLiga, Rand Water and Clinix Health.